This summer, take refuge from the sweltering heat in some of Taipei's unusual and less-known museums. Hidden away in basements and vying for breathing space in crowded streets, the following museums provide a buffet of wonders, garnished with interesting facts, to marvel at. 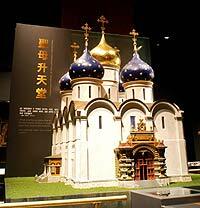 Located in the building next to Sogo Department Store in Yungho, the museum itself is like a department store that showcases 10 major religions of the world in as many sections. Each exhibit focuses on a different aspect of religion, including ceremonial rites and classical literature. Rather than repressive preaching, the museum offers a liberating take on religion, encouraging people to understand and respect all beliefs through its displays of cultural relics, artwork, images, and interactive multimedia exhibits. The MMOT is the largest of its kind in Asia. The museum guides visitors down avenues of more than 150 "room boxes" and cut-away dollhouses that provide snapshots of history with life-like detail on a 12:1 scale, and some are even smaller. Rustic cottages, plush mansions, historical settings and fairy tale scenes come alive with intricately-carved figures and scenery. Visitors can also behold the world's smallest TV. The exhibition's showstopper, however, is the Buckingham Palace and a cut-away view of its grand interiors. Paper will never seem the same again after a visit to this museum. With an exhibition area stacked over three floors, the museum takes visitors on a voyage detailing the history, culture and making of this simple, yet versatile, object. 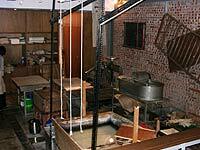 Visitors are introduced to paper production through displays of Taiwanese paper artifacts, handmade products and models, as well as demonstrations of the traditional process of paper milling. The museum also encourages hands-on participation with its Paper Space Workshop, where visitors can make their own paper. During summer, the next best thing to immersing yourself in water is thinking about it. This museum is housed in an elegant Baroque-style building that is part of the Taipei Water Park. Although its unusual name hints at exhibitions detailing the tedious history of bottled water, the museum actually tells the tale of Taipei's first modern waterworks. The museum's pump room displays original water equipment, as well as photos and historical documents regarding the capital's water supply and its early infrastructure development.